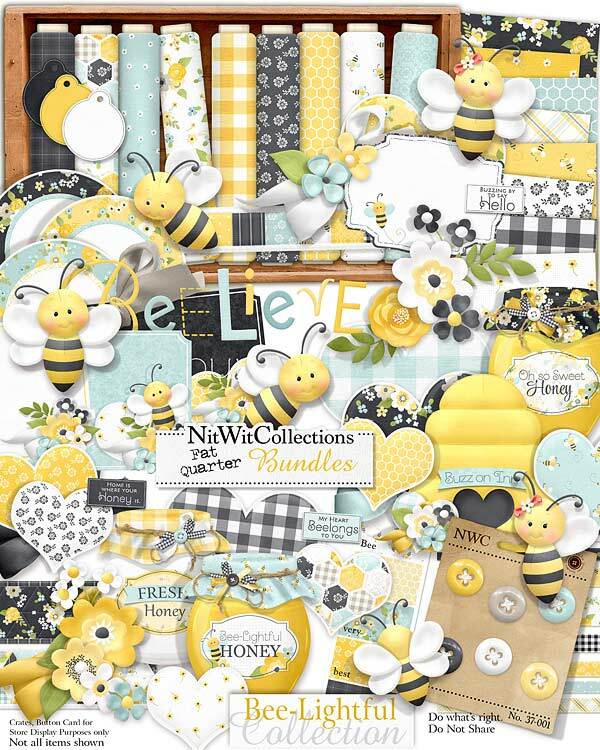 FQB "Bee-lightful" Collection is such a "sweet" digital scrapbook and card making kit that your creativity will be buzzing with delight! Take in the sights of the flowers, the honey jars with fabric-like covers on their lids and not to mention the hearts, journal cards and the background papers in so many colours and patterns that you'll be overwhelmed with choices. This digital kit is perfect for both a cottage shabby craft project or something with a bit more whimsy depending on the background papers and elements that you choose to use. 1 Border in a quilted pattern to add that warm and cozy feel to your layouts, cards and craft projects! 2 Flower elements with stems...sometimes the little bees can reach a little higher! 10 Hearts with various patterns and colours....we're sure you'll find just the perfect one! 1 Beehive - it's the "Buzz on Inn"
3 Jars of honey with fabric like covers on their lids...how cute are these digital elements?! 3 Journal labels that are already adorned for you....you just have to simply add your thoughts and they are complete! 1 Word tag - "My Heart Beelongs to You"
1 Word tag - "Buzzing by to say Hello"
1 Word tag - "Home is where your Honey Is"
1 Word art - "Beelieve in yourself"